*Igor Zelensky, who was originally to perform the role of abderrakhman is unable to perform. Alternatively, Robert Tewsley is taking his place. Please refer to New National Theatre News. *Rank 8: Sold at the NNTT Box Office and all Ticket Pia outlets on the performance date only. Up to 2 tickets per person. No phone reservations. *Seat Z: Sold to students only at some Ticket Pia outlets on the day before the performance. Any tickets not sold by the performance date will be released to the general public at the NNTT Box Office and some Ticket Pia outlets. One ticket per person. No phone reservations. Students must bring a valid student ID. *Same day student tickets (50% off Ranks 1 - 7): Sold at the NNTT Box Office and some Ticket Pia outlets on the performance date. One ticket per person. No phone reservations. Students must bring a valid student ID. The 2004/2005 season for the New National Theatre Ballet features the world of Petipa ballet. The season's lineup includes five famous works by the great choreographer who has continued to be loved throughout the centuries. The season opener is Raymonda, Petipa's last true masterpiece. It is a summation of Russian classical ballet established by the French-Russian choreographer though its complete version is rarely performed today even by world standards. Each act is full of variations displaying the essence of ballet techniques, and the second act is characterized by powerful dance scenes filled with exotic charm. The highlight of the ballet is the final act's grand pas which skillfully combines classical and character dance. 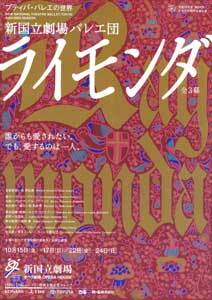 The NNTT will present its original version of Raymonda based on the revised choreography and direction by Artistic Director Maki Asami herself. In the forthcoming new production, Luisa Spinatelli was asked to design the scenery and costumes, which will be a central factor in allowing the story to unfold as if it were a fairy tale. Maki's direction does not necessarily view Abderkrakhman as Raymonda's adversary, but depicts the work as a universal love story between a man and a woman that can happen in any age. Even people today will be able to appreciate the drama woven by the characters in the ballet. The New National Theatre Ballet, together with the wonderful guest dancers, will give a delicate and splendid performance of this original version of Raymonda. The NNTT is looking forward to seeing you at the season's first performance.